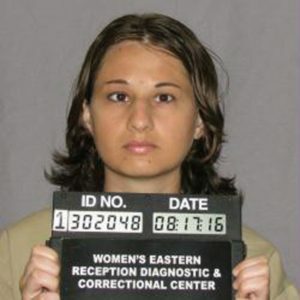 This episode presents the testimony of Gypsy Blanchard in the trial of her former boyfriend, Nicholas Godejohn, for the murder of her mother, Clauddine “Dee Dee” Blanchard. In June 2016, Gypsy pleaded guilty to second-degree murder for her own part in the crime, and was given a 10-year sentence. As Gypsy explains, she met Godejohn on a Christian dating site in 2014, and they corresponded online, often using different names that referred to different aspects of their personalities. Gypsy and Godejohn decided that killing Dee Dee was the only way Gypsy could escape from her mother’s abuse. The couple planned to run away together and get married. Dee Dee had always claimed that Gypsy, then 24, was disabled, needed a wheelchair, and had the mind of a 7-year-old. She said Gypsy’s many ailments included leukemia, muscular dystrophy, a seizure condition, and asthma. In fact, Gypsy was perfectly healthy. She could walk, and never had cancer. Dee Dee shaved her daughter’s head and dressed her in childish clothes to help perpetuate the illusion. Dee Dee created her daughter’s imaginary condition for sympathy, attention, and charity money. When police arrived at the Blanchard home in Big Bend, Wisconsin on June 14, 2015, they found Dee Dee, 48, lying on her bed, dead from 17 stab wounds in her back. Now 27, Gypsy still appears much younger, and speaks in a high-pitched, childish voice. On Friday, Godejohn was found guilty of first degree murder, and awaits sentencing. This was written by Mikita. Posted on at 4:48 pm. Filed under . Bookmark the permalink. Follow comments here with the RSS feed. Both comments and trackbacks are currently closed.